There's a scene in one of my favorite films, Mostly Martha—the staff meal—a relaxed, convivial and familial time in contrast to the mad rush and clamor of dinner service. 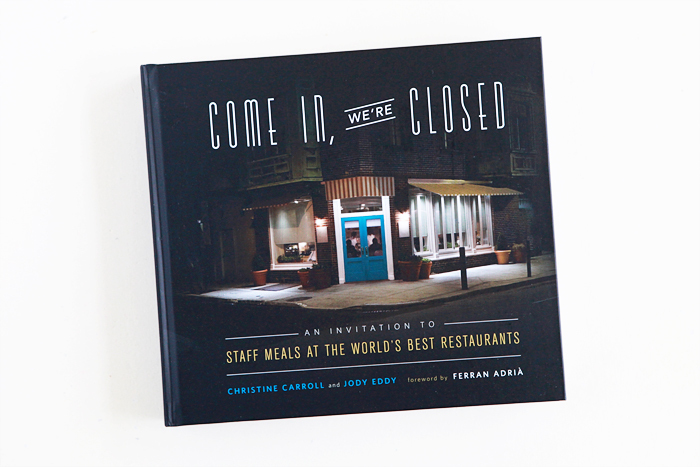 Come In, We’re Closed is an insight into the chefs of some of the most iconic restaurants in the world and the meaning and philosophy behind the meals they serve to the heart and soul of their establishment—their staff. “Staff meals seem to offer a different view of the professional kitchen. A way to go behind the scenes only to discover that the old adage is true: ’To cook well, one must eat well.’ So when I visit restaurants, I am always wondering what dishes are being made for the kitchen and dining room staff? What menus are planned? For after all, how can people who serve food to others not eat fantastically?” From the foreword by Ferran Adrià. The Arzak and Mugaritz chapters resonated with me the most because I lived in Spain for a year and have traveled through the Basque country a bit (and of course hope to be back). “‘Basques are powerful people. We need powerful food,’ says the silver-haired Juan Mari, a chef in his late sixties who radiates such sincere kindness, you can’t help feeling like you are the most valued diner in his care. The third generation in his family to run the restaurant, Juan Mari explains that the 4 p.m. family meal always features traditional Basque dishes: ‘To remind us where we came from.’” From Juan Mari of Arzak. Written by Christine Carroll and Jody Eddy. Published by Running Press.